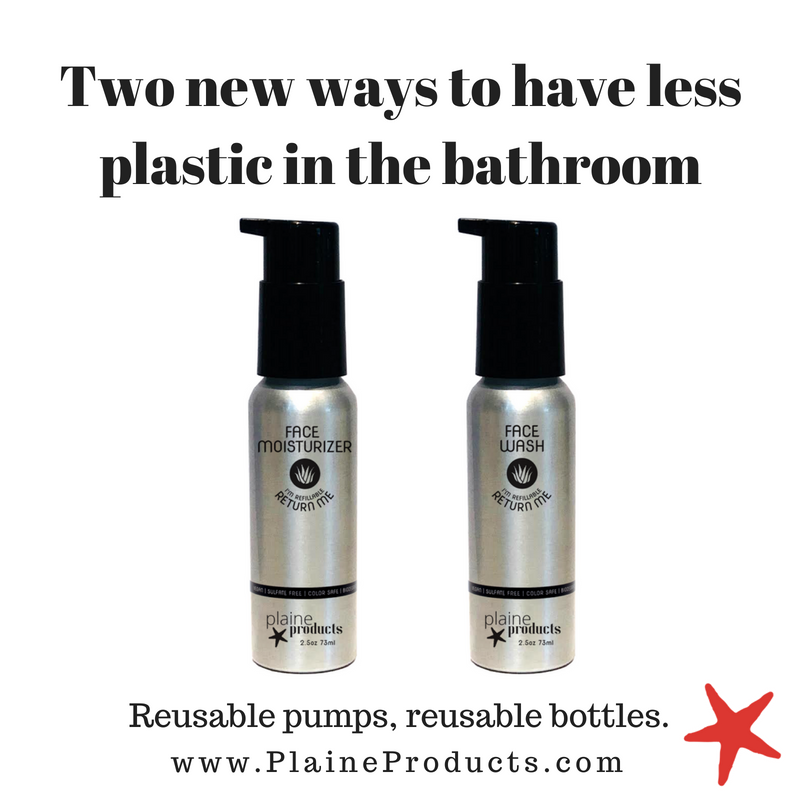 -EarthHero: A one-stop shop for all things sustainable, EarthHero has several bulk beauty offerings, including refillable Plaine Products shampoo, conditioner, and body lotion, All Good sunscreen in a reusable, recyclable metal tin, or a bulk, 32-ounce bottle of mineral sunscreen. -Etsy: It’s harder to say what you can’t find on Etsy than what you can. Of interest to the zero-waster: package-free shampoo bars (or this one), vegan body butter in a glass jar, or lip tint in a compostable tube. Look for items that come unpackaged or are in containers you could reuse or donate, and then leave a note to the seller that you’re hoping your order will be shipped in reused packaging rather than new. If you’d like to minimize shipping distance, use their geographical search tool to narrow the field to your local area. This directory will live permanently in the sidebar at right, under the name “Online Bulk.” I’ll continue to update it there as I learn of more resources; I hope this can be helpful over and over again. PS. The “Essentials” page up top is back, by popular demand (so many kind emails!). I’ve been re-vamping it to be more useful and to focus on highlighting smaller makers. Keep checking back for more. 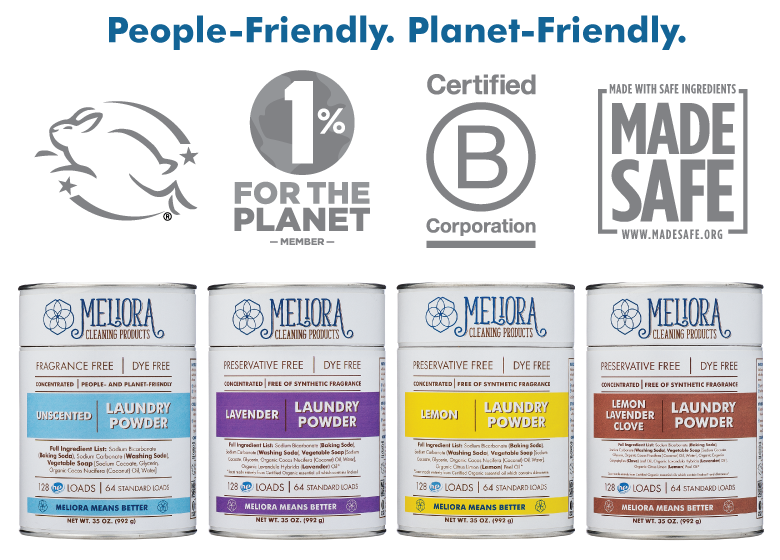 Thanks to The Refill Shoppe and Meliora Cleaning Products for sending samples my way to photograph for this post. This summer, I'm tackling what low-waste grocery shopping could look like, if stores near you don't make truly zero waste grocery shopping easy or doable. (Find parts one and two of the series). I've said it before, but since progress is the goal here, not perfection, it's totally fine if your grocery haul currently looks more like the above than, well, something more like this. -Bananas. I learned from a friend that single bananas are more likely to go unpurchased and be thrown away than bananas in bunches or pairs. So, I've been picking them up myself! -English cucumber. Those long, skinny cucumbers called English cucumbers almost always come entirely sealed in plastic (why?). So, instead I purchased a regular cucumber and tucked it into a reusable produce bag. Yes, I am a grocery store tyrant, sorry Mom. -Garlic. Since you don't eat the skin, it doesn't really need to go in a bag. I placed it in my cart loose. -Lemon. The first lemons I saw at the store were packaged in a net mesh bag containing a few lemons. Nope. Usually stores who sell bagged lemons that way also sell individual ones. After another moment of looking around, I found the single lemons and popped one in my cart, sans produce bag. -Flat leaf parsley. Many stores now sell large bundles of unpackaged herbs, in lieu of those small plastic clamshells of herbs. Always look around to make sure you can get the herbs package-free before resorting to plastic-packaged. Luckily, this was the case with parsley, which I just placed into a cloth produce bag. -Cremini mushrooms. When I purchase mushrooms at the farmers' market or my local Whole Foods, they're loose and I'm able to fill my own bag with only what I need. Loose mushrooms are fairly rare at other grocery chains, though, which really leave you no option but to buy them packaged. I'll recycle the cardboard box, but the plastic wrap will become trash. (Instead, you could seek out mushrooms at the farmers' market or even grow your own). -Two boxes of spring greens. Instead purchasing two smaller boxes as requested, I bought one bigger box to save on packaging. And, this box is recyclable, which gives it a leg up over plastic bags of washed salad mix. If you wanted to go a step further, you could buy a head of lettuce instead and chop and wash it all at once, so that it's just as easy to reach for in your fridge as a box of pre-washed baby greens. -Brown rice and green lentils. This one was tough. Brown rice and green lentils also came in plastic boxes, which would have been recyclable (to my knowledge, the bags these came in - pictured above - aren't). But the boxed rice and lentils were conventionally grown, and I wanted to stick to organic, which meant buying the bagged versions instead. One of the times that zero waste is most frustrating is when I have to choose between organic / not zero waste and conventional / zero waste. I took the bags back with me to Chicago, where I'll use them as makeshift "trash cans" under my sink before I toss them for good. -Ranch dressing. Always a crowd pleaser, ranch dressing was requested for a salad to bring to a potluck. I found it in a glass bottle, which could be recycled, donated, or even upcycled - with the label removed, wouldn't that be a cute flower vase? Or a pencil holder? As a bonus, I loved the smaller size, since I thought that a larger one would go unfinished at our house. -Sandwich thins. I chose the variety with the least amount of packaging. Some of the options on the shelf came packaged in a plastic bag inside another plastic bag, what?! "I’m not trying to 'win' zero waste. I’m not trying to prove anything to anyone on Instagram or online about how little trash my family can produce. I’m setting myself up for the long haul – for a lifetime of my family being mindful about how we view materials and treat our planet through decisions big and small." Okay, now fess up: how similar to or different from your weekly haul is this? Would you have approached any of these choices differently? I'd love to hear. Back next month with the next installment in this series - leave me a comment with what you'd like me to tackle in that one! PS. You can read the rest of this series right here. First up in my summer series of trying to shop zero waste at a few of the large Midwestern grocery chains, we've got that Chicago cult fave: Jewel-Osco. Jewel-Osco is pretty much your standard big-box grocery store: a small organics selection, lots of conventional produce, and then basically a whole store of packaged foods and no bulk aisle. Come walk with me through the grocery store as I take you through how I made the decisions I did! I visited on a Sunday night to grab ingredients for a few days' worth of meals. Because I live within walking distance to work, where there's a grocery store with a bulk section two minutes away, I typically shop for just a few days rather than picking up ingredients for a whole week's worth of meals. It's so easy to pop in and out of that store, and my evenings these days can be unpredictable (always up for a last-minute hang-out with pals). This helps ensure that I actually eat what I buy, and means that I have flexibility to do whatever I want in the evenings rather than worrying about what produce might be going bad. So, I went to Jewel-Osco with a few thoughts of what I might eat the next few days bouncing around in my brain, but no firm plan. I think that's the best way to approach shopping zero waste at stores where it's a bit harder: having some sense of what you might want to eat, but being flexible in case what you want is only available in some form of heinous plastic packaging. It was HOT that week, and I wanted a few simple, low-oven meals: sandwiches, panzanella, salad, and then some healthy snacks. With my cloth bags and reusable produce bags in tow, I made a bee-line for the organics section - although it's worth noting here that you certainly don't need to choose organic to be zero waste. I picked up celery, carrots, and apples for simple snacks throughout the week. Instead of baby carrots or shredded carrots, I bought whole carrots, which came with just a twist tie instead of a plastic bag. If you rely on baby carrots for lunches or snacks, you could purchase whole carrots and then cut them up into sticks yourself to store in the fridge. In the produce section, I also picked up a lemon (to put in water for a summery beverage) and tomatoes for the panzanella. Next, I visited the bakery section to grab bread. Choosing loose mini loaves instead of plastic-packaged shelf-stable loaves enabled me to use my own cloth bag from home, zero waste style. I toasted these babies into croutons for salad and panzanella, and split them lengthwise for simple veggie sandwiches. The other things I needed were beans to add body to the panzanella and to turn into homemade hummus, as well as vinegar for the panzanella and for salad dressing (I was using olive oil I already had on hand at home). I chose to buy beans in cans, knowing that the cans were recyclable. I also considered buying them dry in larger plastic bags, but I ultimately wasn't sure if the stretchy plastic bags were recyclable; I collect stretchy plastic bags that come my way and take them to a local drop-off for recycling, but I never am confident that they actually get recycled. So, cans it is. However, dried beans have a lower transportation weight (there's water in the cans), and you get more beans in the package - essentially a form of buying in bulk. So I think it could go either way on that one. I also purchased a small glass bottle of vinegar. I chose this one because it looked like the tastiest one on offer, but as a bonus it's packaged in glass (recyclable!) and I can take the cork on top to be recycled too, unlike a plastic cap that other ones would have. The bottle is so pretty, though, that I might peel off the label and include it with my next thrift store donation - I bet someone would love to reuse it. I also grabbed soba noodles in packaging. I've been unable to find soba noodles in bulk anywhere in Chicago, and for years I did without - but I love them, they're protein packed and cook quickly, and I just find that my life is way better with them. So though they're not zero waste by any means, I still buy them. And I'm so happy that I do. I chose this brand because it's organic, inexpensive, and I can compost the cardboard insert. Since I gave away my trash can a few years ago, I keep non-recyclable plastic "bags" like the one the soba noodles come in under my sink to corral small pieces of trash I make. I like being able to upcycle them once before they hit the landfill. Total non-recyclable trash from this trip: a receipt, five produce stickers, three twist ties, and the plastic sleeve on the soba noodles. Not too bad, right? The major key to staying zero waste here was purchasing mainly produce and then bringing it home in reusable cloth bags rather than plastic. In total, I spent around $30 on this haul, but many of the items - celery, carrots, vinegar, soba noodles - lasted for a while. And, I could have chosen less fancy vinegar to bring down the total. Is this similar to or different from a typical shopping trip for you? Anything you would have done differently? For more in my series on how to grocery shop without access to bulk foods (and to see who's profiling groceries in other parts of the country), hop over here. If you've tried to go zero waste, there's one thing you already know: in many ways, it's all about what you can find in bulk near you. I've experienced the joy of finding things I need in bulk and the frustration of not having access to other things package-free. We probably all wish our bulk options were a little bit, or maybe even a lot bit, better. And yet, there are so many places where bulk grocery options are truly nonexistent. Maybe there isn't a bulk aisle near you; maybe there's one in your city, but it's too far from you to be a viable option. I'm fortunate to have the time and money to be able to prioritize bulk shopping, even if it means going out of my way to do so (which it often does), but not everyone's in the same camp. So, this summer I'm excited to be partnering a with a few other zero wasters from around the country to share how to shop lower-waste at some of the bigger chain stores where you might already shop. Throughout the summer, I'll take you to three local Midwest grocery stores that aren't my typical zero waste go-tos, and we'll talk through the choices I made and how I stayed low-waste there. Then, at the end of the summer, I'll share the breakdown of what I've learned about how to think about shopping zero waste sans bulk, with hopefully lots of nuggets of advice you can tuck away for your next trip to the grocery. -East: Meredith of Meredith Tested will be profiling Trader Joes', Costco, Hannaford Supermarket, and Wal-Mart. -Midwest: That's me! I'll be taking you to Kroger, Jewel-Osco, and Wal-Mart. -West: Andrea of Be Zero will be featuring Lucky's, Safeway, and Wal-Mart. Before we start, know: I'm a big fan of shopping locally and small. Farmers' markets can be some of the best places to find package-free produce, and if you're choosing produce wisely it can be affordable, too. For example, tomatoes in June are pricey, but tomatoes in the August glut are less expensive. Plus, many markets accept and match SNAP benefits (if you live in Chicago, here's a list of which Chicago area markets do). It's good to keep food dollars in the community, with farmers and co-ops and smaller stores. That much is for certain. But if that approach doesn't work for you - time, money, transportation, the constraints of geography - that in no way disqualifies you from being zero waste. It just means you may have to get a little creative at your supermarket. Do you struggle with finding access to places where you can shop zero waste-ish? What have been the biggest challenges for you? If you leave them in the comments below, we'll tackle them together. Back later this week with the next installment! Pictured is my current grocery shopping kit: a Baggu bag bought secondhand, as well as cloth produce bags from Dans le Sac and Simple Ecology. You can find more thoughts on what to pack when you go to the grocery, here.